The club's development squad boss takes charge following Owen Coyle's departure. 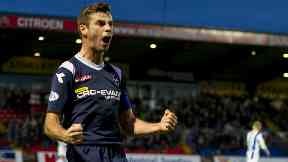 Ross County have appointed Development Squad coach Stuart Kettlewell as the club's new manager. Kettlewell, a former County player, takes charge until the end of the season following the departure of Owen Coyle on Thursday. He will be assisted by Steven Ferguson. The 33-year-old will now work to lift the team out of relegation trouble with the Staggies currently three points behind Partick Thistle at the bottom of the Premiership table. He will have to wait to take charge of the team for the first time after Saturday's match against Thistle was postponed because of the severe weather. The new manager's first game in the dugout will be away to Kilmarnock on March 10. Kettlewell played for County between 2009 and 2014 and was part of the squad that won the Challenge Cup in 2011 and the First Division a year later. After two years with Brora Rangers he returned to County as manager of the under-20s team and had an immediate impact, leading the side to the Development League title last season.